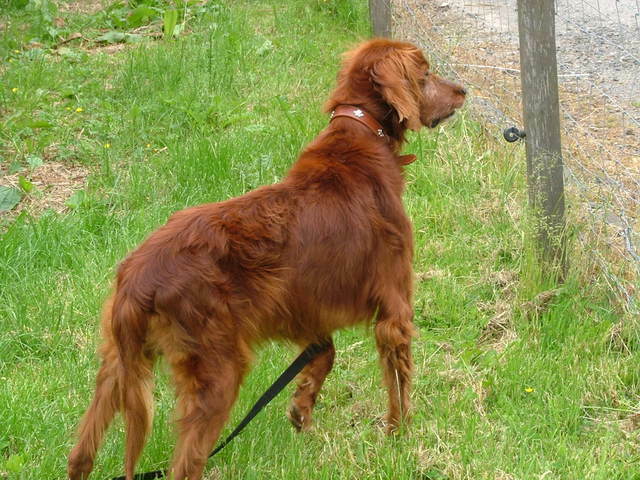 The Irish Setter is an elegant bird dog with a large build. Rectangular in shape, it is longer than it is tall. 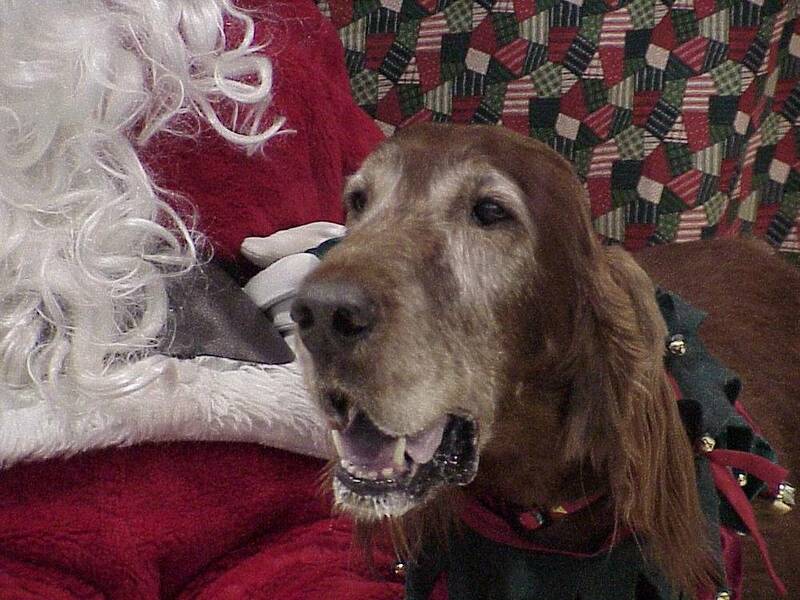 A sturdy dog, it has style and grace and at the same time is an excellent athlete. 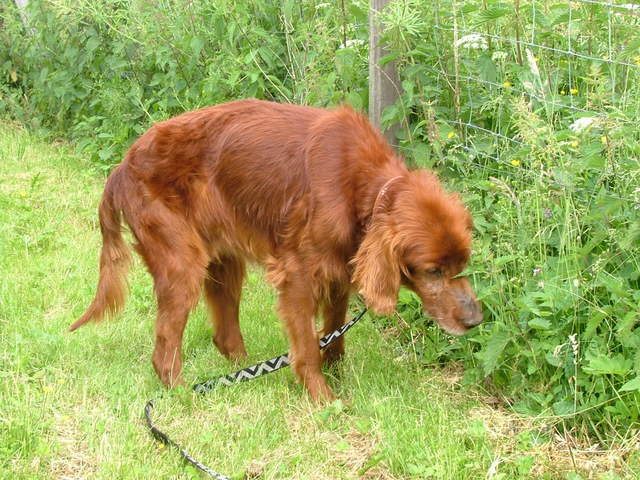 Its head is long and lean with a defined muzzle and long, thin ears set low and back on the head. Its almond shaped brown eyes give it a soft expression, and its nose is either black or chocolate. The dog has either a scissor or even bite. The tail is long, tapered and feathered, carried straight out horizontally from the body or curved slightly upward. 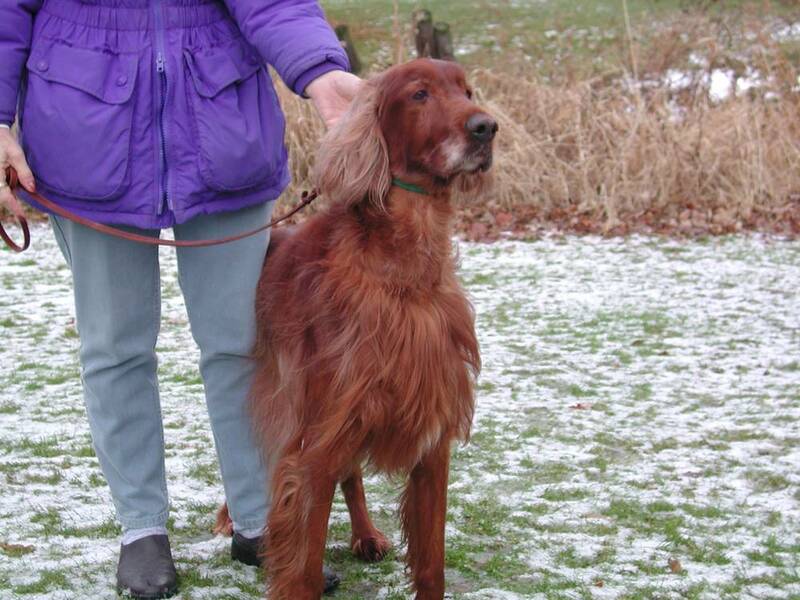 Its coat is long and smooth, and hair on the ears is silky. The coat is straight all around the body with feathering behind the legs and on the belly and tail. The color is a beautiful mahogany or chestnut red. 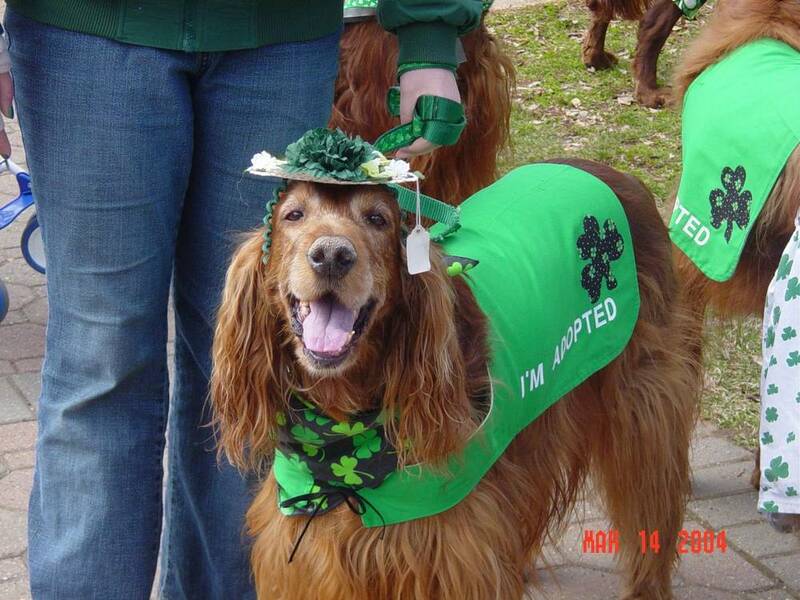 The Irish Setter approaches life with a can do attitude, and its positive good humor is a distinguishing characteristic of the breed. This dog is almost never vicious or aggressive, but it does have a habit of playing rough and is not recommended for small children. If trained consistently and given sufficient exercise, this loveable dog can be the perfect family pet. It needs a large yard to stretch its legs and does best in the country with fields and forests to roam. These dogs should be able to run free at some point every day or go for a long walk or jog. 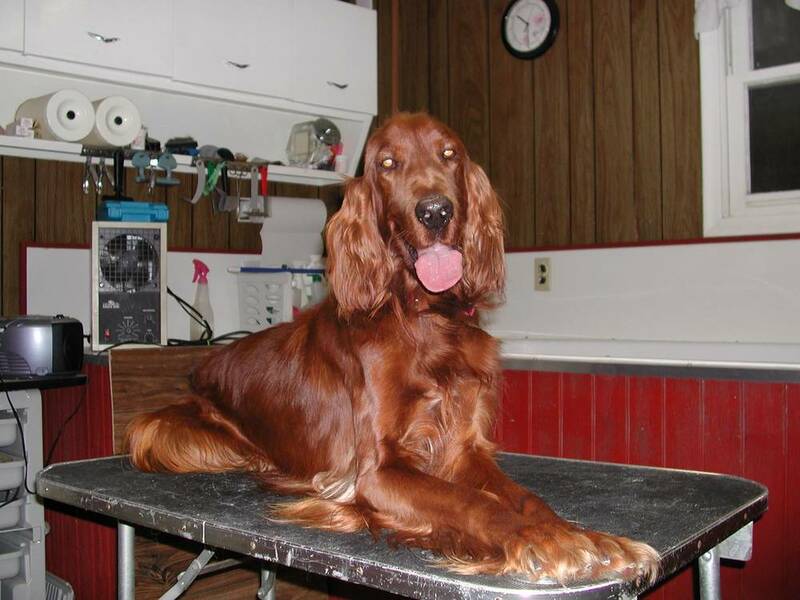 If it does not get exercised enough the Irish Setter can become misbehaved and destructive. This breed is an average shedder that requires daily brushing in order to prevent matting and to get rid of burrs. Health concerns in this breed include canine hip dysplasia, progressive retinal atrophy and gastric torsion. Less pressing concerns include hypothyroidism, osteosarcoma, panosteitis and megaesophagus. This new breed was a skilled bird dog with a powerful nose, and by the 1850s it had spread throughout Britain and Ireland, and was beginning its trans-Atlantic voyage to America. 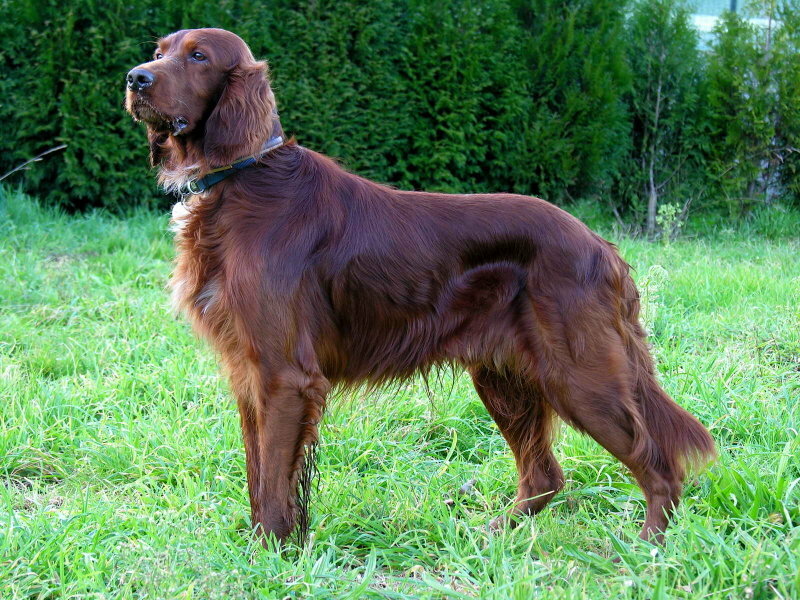 Irish Setters of red and white coloring had existed longer than the solid red setter, but beginning in the 19th century it was decided by dog fanciers that solid red was the only acceptable color. This preference became even more pronounced as the breed began to enter dog shows. 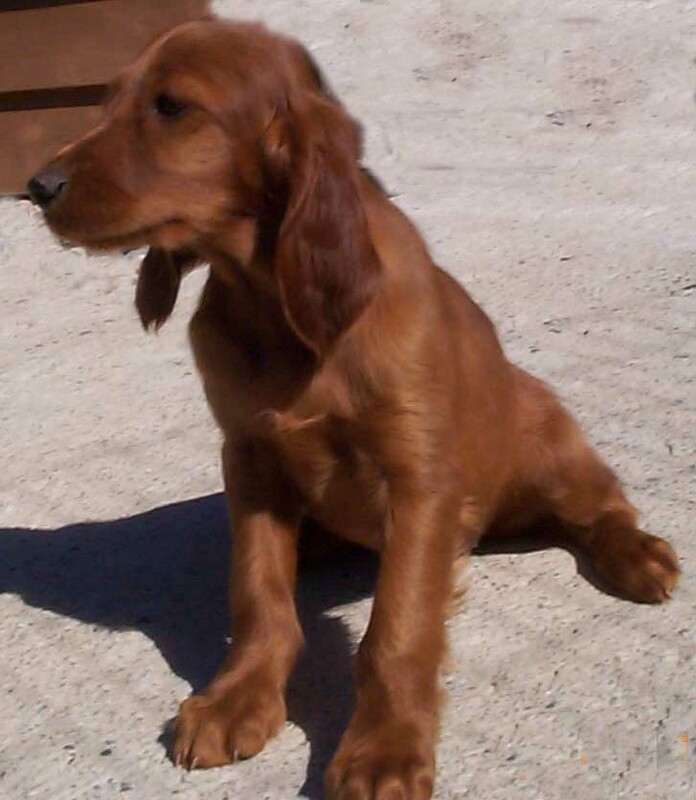 The metamorphosis of the Irish Setter from hunter to show dog began in the 1860s and was largely the result of a particularly elegant Irish Setter named Palmerston. 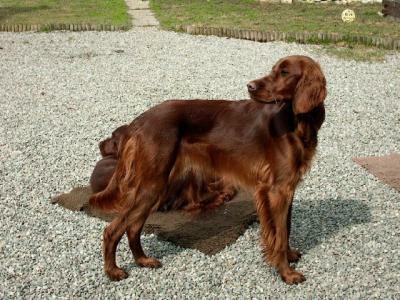 Labeled as being too pretty to be a worthy hunting dog, Palmerston was abandoned by his owner and adopted by another man who appreciated this unique setter. 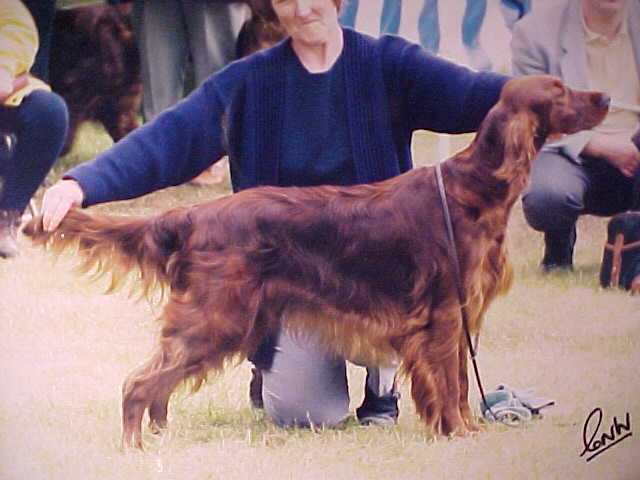 Palmerston became phenomenally successful as a show dog, and sired countless offspring so much, in fact, that virtually every modern Irish Setter can be counted among his descendants. 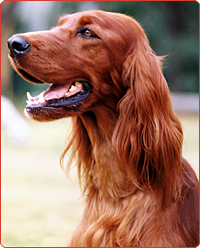 During the 1970s, the Irish Setter was among the most popular breeds in America, though today the dog is rarely in the top third. 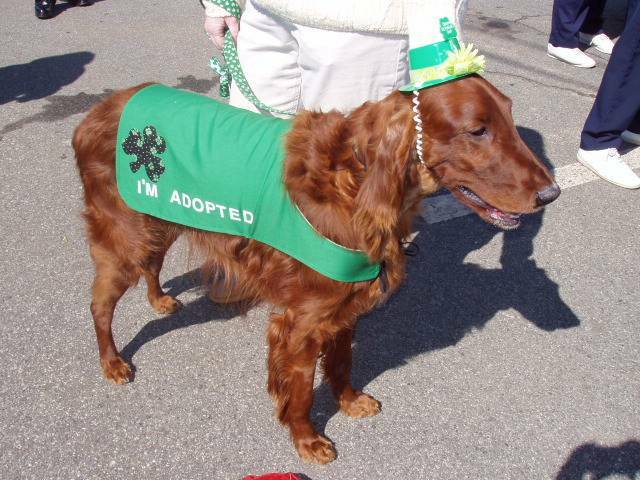 The Irish Setter was recognized by the American Kennel Club in 1878.